In my list of goals for 2009 I said that I wanted to work on smaller knits every once in a while, and I guess I got started a little early on that. I finished these back in December, but I just got around to photographing them. 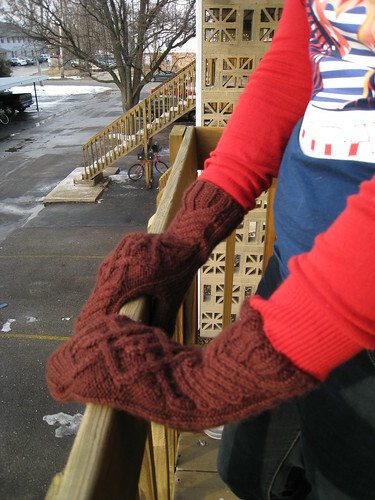 I didn't change the pattern at all, but I should have taken out one of the repeats on the wrist. I have comically small hands and the tips of these sort of flop around, it makes me feel like a little kid. The yarn hasn't held up perfectly, it's definitely pilled pretty bad. The biggest bummer about these is that they aren't very warm! I wet-blocked them in the hopes that the yarn would bloom some, and it did, but not enough to make a really solid fabric. 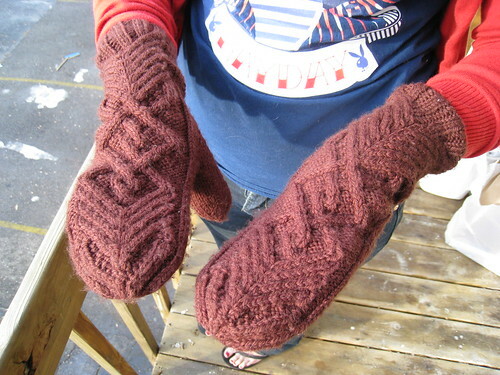 They're definitely pretty, but not the most efficient mitts I have! We're having one of those days where you're coming out of winter, but there's a few days where the weather feels like spring, even though you know it's too early. It's been in the 50s today, I even wore flip flops! I hope it stays warm for a few more days, I can't take the winter anymore! 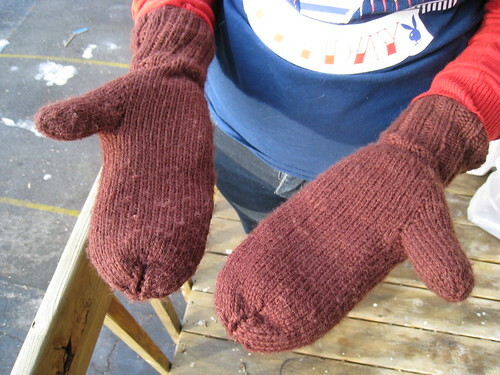 Those mitts are lovely. I suggest wearing a pair of thin gloves inside. The combination keeps my fingers toasty warm even at -30C. It's too bad they aren't very effecient because they look lovely. If it makes you feel any better, I have freakishly small hands, too, and that usually means having to adjust mitt patterns to make them come out smaller. And please, come jump on the lazy people afghan bandwagon! I've always wanted to do an afghan, I just think it will actually get done if I do it square by square over the period of a year. And the monthly squares make it a nice little project to carry around with you. You're so lucky to be coming out of the cold! I love those mitts! I tried to find your blog at the old address and it seems to have been moved here, and I'm so glad to have found it. Mind if I linked you on mine? They look really pretty!! I am making these as well, and even though I have man-hands, they are even long on me. Also, I've got a pair of mittens I made that weren't warm enough and I ended up lining them with these super thin mittens from target (they were like $2) and I just tacked them in, and now they are perfect. Love the color you chose!